Between presents, decorations, and new clothes for all the cocktail parties, holiday costs can quickly get out of hand. That’s before we even get to the main event: the big holiday dinner. Though always fun to attend, they are stressful on the host. Preparing food for 15-20 or even more people is a tough challenge, with an equally tough economic burden as well. Thankfully, there are a few tricks to hosting a budget holiday dinner without seeming cheap. Follow these tips to save money on your next holiday feast. The first piece of advice to help save money on your next holiday feast is to simply reduce the amount of food you make. A great way to do this is by inviting others to contribute by preparing dishes. The potluck idea is very common around the holidays, so you shouldn’t feel awkward asking for a little extra help. In fact, turning this into an annual tradition can simplify planning the next time around that someone else’s dish is specifically request (thereby freeing your schedule!). Keep in mind that guests can also be asked to bring wine, champagne, or perhaps even store-bought dessert. This is especially good for those whom don’t enjoy cooking or for whom cooking doesn’t come naturally. As the host, you’ll be preparing a lot of food for a lot of people. Since the cost of this can quickly add up, one way to save is by finding a few dishes that are really cheap to prepare. Try one of these budget-friendly holiday recipes this year to keep costs under control. Apply the same method when it comes to appetizers. This is where a lot of sneakily expensive items are found, so it definitely pays to cut back. Forget about those fancy cheeses and pates, go instead with olives and maybe some homemade popcorn sprinkled with salt and paprika. Appetizers should be kept very light anyway – there is no need to encourage people to fill up before the main courses are served. Rich desserts can drive up the price as well, and we often eat so much beforehand that there’s barely any stomach space anyway. Steer clear of cheesecakes (especially those requiring mascarpone) and check out instead these Budget Dessert recipes, which can for the most part, all be topped off with generous scoops of ice cream. 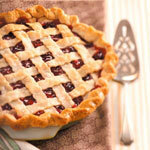 Take for instance the image on the left of a delicious-looking Cranberry Cherry Lattice Pie, which apparently comes down to $0.81 per serving. Plan your holiday menu at least a few days in advance. If you don’t receive store sales or flyers in the mail, remember that these can usually be found on the store’s website. Get the most out of your food by discovering how to preserve fruits and vegetables, and freeze meat ahead of time to eliminate the stress of going last minute. Don’t forget to sign up for each store’s newsletters to receive coupons directly in your email inbox. Combine these with sale items to double your savings. Couponing is one of the best methods to significantly reduce grocery spending throughout the entire year, and especially just the rush of the holidays. In fact, countless people have cut their monthly grocery bill by a significant amount simply by getting the most out of their coupons. Try to get coupons from as many different sources as possible — either via email, online, or even clipping out of newspapers. While some stores allow “stacking”, which is basically the use of multiple coupons simultaneously as long as the coupons come from different sources, many actually don’t. Make sure to check rules and regulations carefully. Also, by categorizing coupons by category and expiration date, it’s easy to keep them organized. Saving money on your holiday dinner is about more than just food. Home decorations can be costly as well, so this is a good place to try and reduce spending. With a few do-it-yourself techniques, you’ll save money while at the same time providing an important personal touch to the holiday home environment. Incorporate natural materials where possible, as these provide wonderful fresh scents and can be collected for free during outdoor walks. 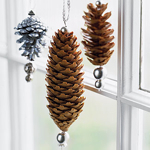 For inspiration, be sure to check out our Frugal Christmas Decoration Ideas. How do you save on your holiday feast?